You certainly know how to make children happy. 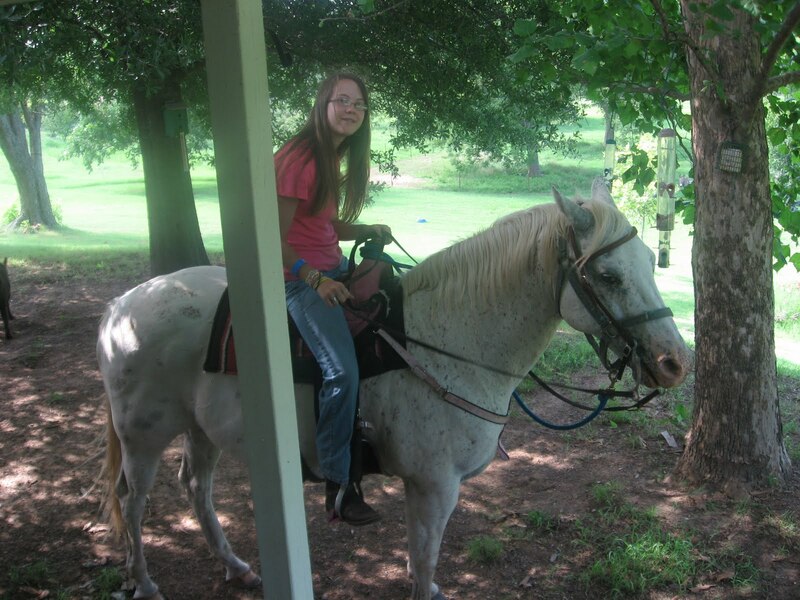 A day or two ago, Brenna came riding up to the back porch on her “borrowed” horse White-Tee. I took this picture of her docile steed and her joyful face. It reminded me of another little girl and an old piano. You recall the piano, I’m sure. It was an old upright that had been in a little clapboard country church for decades. Its varnish was cracked and its keys were yellowed, but the tone and tune even after being moved in the back of a pickup truck were fine. Rachel had wanted a piano since she could talk. She ached for one of her own. She asked us again and again, but at that time we really couldn’t afford to consider it. When your daughter wants something so badly it is painful to say no. We told her that there was no way we could buy her dream for her, at least for a few years. We told her to pray and tell you about her wish. That night she prayed for you to send her a piano. She must have had great faith because the next afternoon the phone rang. It was Rachel’s Grandma. Her church was purchasing a new piano and had to move the old one. She wondered if Rachel still wanted one. If we would come pick it up within a week, she could have it. We did, of course, and that old piano was a thrill to Rachel. She learned to play on it. When she was teenager she was able to buy a better instrument. But that first one was her own personal miracle and her faith and talents grew. Brenna wanted a horse to ride. This beautiful and calm horse is her personal miracle. She keeps him and rides and trains him, but for now he belongs to a neighbor. The neighbor even provided a saddle and tack and a request that she keep the horse in our pasture and ride him often. Jesus, you are good to bless us with such things. You show us that you know our needs and our hearts’ desires and that you care, even about dreams like pianos and ponies.